https://kaska2016.sites.olt.ubc.ca/files/2017/02/01000-kkz-LJ-WL-07-14-16-Making-soapberry-icecream-What-do-soapberries-taste-like-1.mp3 Rose: Dēsgū́h gūshoshīdzídzéʼ łedī́h-ā? https://kaska2016.sites.olt.ubc.ca/files/2017/02/01001-kkz-LJ-WL-07-14-16-Making-soapberry-icecream-Sometimes-they-are-sweet-and-somethimes-a-little-bitter.mp3 Grandma: Łáhtādé łedī́h īyéh łáhtʼāde déstsʼīʼ. https://kaska2016.sites.olt.ubc.ca/files/2017/02/01003-kkz-LJ-WL-07-14-16-Making-soapberry-icream-You-can-make-soapberry-ice-cream-out-of-them-that-is-really-tasty.mp3 Grandma: Łā́néyéh gūshoshīdzídzéʼ łēngis. Łą̄́ łedī́h. Really- soapberries- you stir.- Really- tasty. You can make soapberry ice cream out of them. It is really tasty! https://kaska2016.sites.olt.ubc.ca/files/2017/02/01004-kkz-LJ-WL-07-14-16-Making-soapberry-icecream-Grandma-how-do-you-make-soapberry-ice-cream-can-you-teach-me.mp3 Rose: Essų̄ dēsgū́h mełēngis-ā? Kesenhdį̄! Grandmother- how- you stir it-information question?-Teach me! 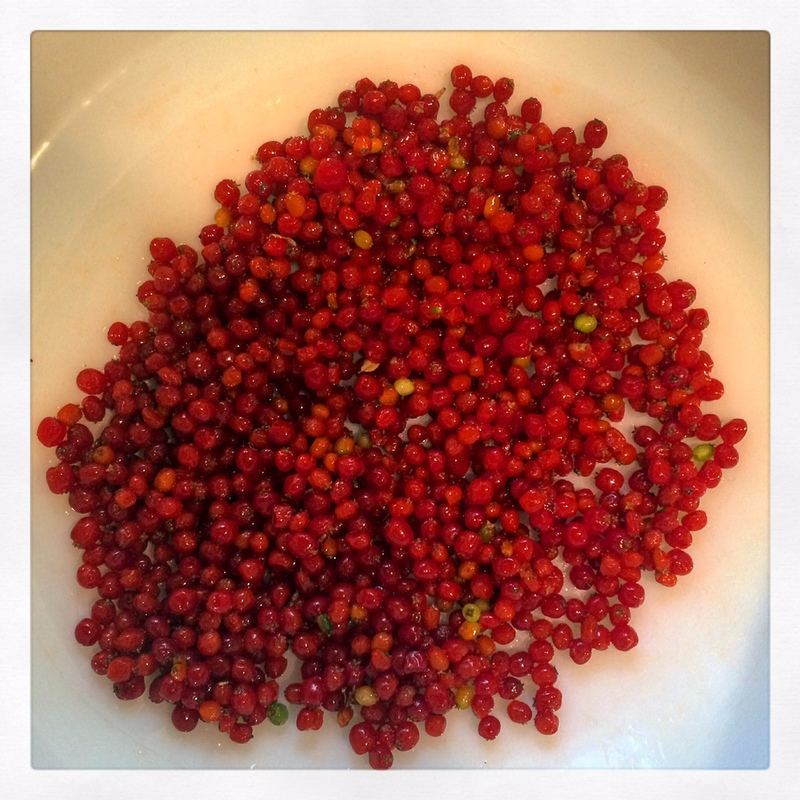 Grandma, how do you make soapberry ice cream? Teach me! https://kaska2016.sites.olt.ubc.ca/files/2017/02/01005-kkz-LJ-WL-07-14-16-Making-soapberry-icecream-Sure-its-easy-lets-make-it.mp3 Grandma: Ham, dūłā́ dededlah lā. Hadī dzūhtsį̄hī! Yes, not difficult- assert.- Hurry- letʼs make it! https://kaska2016.sites.olt.ubc.ca/files/2017/02/01007-kkz-LJ-WL-07-14-16-Making-soapberry-icecream-You-mix-in-some-sugar-and-cook-it.mp3 A: Łedī́hī́ meténtlʼī́t īyéh enht’ḗs. Sugar- you pour in- and then- you cook it. https://kaska2016.sites.olt.ubc.ca/files/2017/02/01008-kkz-LJ-WL-07-14-16-Making-soapberry-icecream-How-do-you-dry-berries.mp3 Q: Dēsgū́h dzídze enhgan-ā? How do you dry berries? https://kaska2016.sites.olt.ubc.ca/files/2017/02/01009-kkz-LJ-WL-07-14-16-Making-soapberry-icecream-You-spread-them-on-a-cloth-and-put-them-in-the-sun.mp3 A: Echʼéléʼ kā néntlʼī́dī́ sā yūhganī dege. Cloth-on-you pour- sun- dries it- for. https://kaska2016.sites.olt.ubc.ca/files/2017/02/01010-kkz-LJ-WL-07-14-16-Making-soapberry-icecream-How-do-you-find-a-good-spot-to-pick-berries.mp3 Q: Jahyigé dzídze łą̄́ gūtīe neyehī gā́gūnahʼą̄h-ā? Where- berries-really- good- grow- you find-information question? People- to- you- all say like, where- berries- lots- grow-information question? You ask people where it’s good to go. https://kaska2016.sites.olt.ubc.ca/files/2017/02/01012-kkz-LJ-WL-07-14-16-Making-soapberry-icecream-How-do-you-knock-berries-off-the-bush.mp3 Q: Dēsgū́h dzídze nénhī́l nédūtlʼī́dī dege? How- berries, you hit- might fall off- for? How do you knock the berries off the bush? https://kaska2016.sites.olt.ubc.ca/files/2017/02/01013-kkz-LJ-WL-07-14-16-Making-soapberry-icecream-You-use-a-stick-to-knock-them-onto-a-plastic-bag.mp3 A: Dechen yéh nénhī́l plastic bag kāge nédūtlʼī́dī dege. Stick- with- you hit- plastic bag- on it- will fall- for. https://kaska2016.sites.olt.ubc.ca/files/2017/02/01014-kkz-LJ-WL-07-14-16-Making-soapberry-icecream-How-do-you-make-moccasins.mp3 Q: Dēsgū́h kē enleh-ā? How- moccasins- you make-information question? 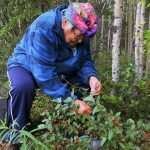 https://kaska2016.sites.olt.ubc.ca/files/2017/02/01015-kkz-LJ-WL-07-14-16-Making-soapberry-icecream-You-ask-someone-to-teach-you.mp3 A: Dene tsʼį̄́ʼ kēdendīʼ kenegūhdī dege. Person- to- you say like- she will teach you – for. You ask someone to teach you. https://kaska2016.sites.olt.ubc.ca/files/2017/02/01016-kkz-LJ-WL-07-14-16-Making-soapberry-icecream-How-do-you-make-drymeat.mp3 Q: Dēsgū́h etsén tédentʼā́z-ā? How- meat- you cut-information question? How do you make dry meat? https://kaska2016.sites.olt.ubc.ca/files/2017/02/01018-kkz-LJ-WL-07-14-16-Making-soapberry-icecream-How-do-you-tan-hide.mp3 Q: Dēsgū́h kedāzís enhtsīh-ā? How- moose hide- you make-information question? 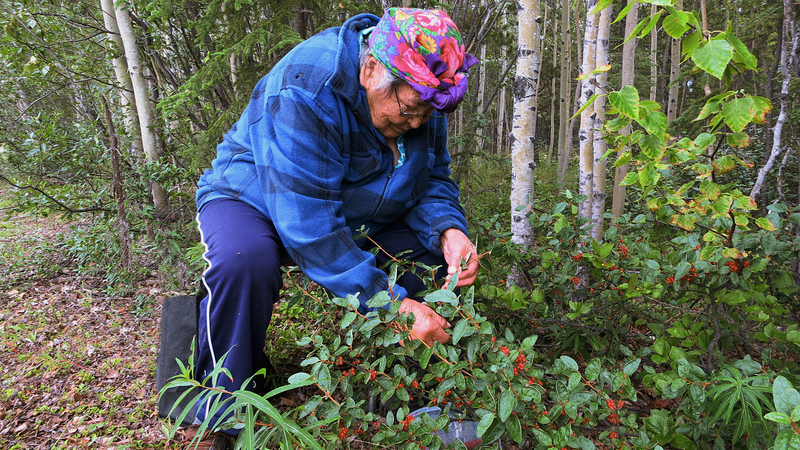 https://kaska2016.sites.olt.ubc.ca/files/2017/02/01019-kkz-LJ-WL-07-14-16-Making-soapberry-icecream-You-work-with-an-elder-to-learn.mp3 A: Echōʼ yéh kī́nhłāʼ kenūhdį̄ dege. Elders- with- you work- you will know- for. https://kaska2016.sites.olt.ubc.ca/files/2017/02/01020-kkz-LJ-WL-07-14-16-Making-soapberry-icecream-How-do-you-set-traps.mp3 Q: Dēsgū́h hę̄́ł nénleh-ā? How- traps- you set-information question? https://kaska2016.sites.olt.ubc.ca/files/2017/02/01021-kkz-LJ-WL-07-14-16-Making-soapberry-icecream-You-go-with-somebody-on-their-trapline.mp3 A: Dene yéh géndah dehę̄́léʼ sahłaʼ tah. Person- with- you go around- his/her set among. You go with somebody on their trapline. https://kaska2016.sites.olt.ubc.ca/files/2017/02/01022-kkz-LJ-WL-07-14-16-Making-soapberry-icecream-Soapberries-get-ripe-in-july.mp3 1. Etsedzī Sā gūshoshīdzídzéʼ denedī́l lā. https://kaska2016.sites.olt.ubc.ca/files/2017/02/01023-kkz-LJ-WL-07-14-16-Making-soaberry-icecream-You-can-pick-soapberries-even-when-they-are-still-green.mp3 2. Gūshoshdzídzéʼ nédetlʼęse ghólī́ nenbéʼ. https://kaska2016.sites.olt.ubc.ca/files/2017/02/01024-kkz-LJ-WL-07-14-16-Making-soapberry-icecream-Green-soapberries-make-white-icecream.mp3 3. Gūshoshdzídzéʼ nédetlęse mełēngisī dé dekʼale edē lā. Soapberries- green- you stir- then- white- it becomes- assert. Green soapberries make white ice cream. https://kaska2016.sites.olt.ubc.ca/files/2017/02/01025-kkz-LJ-WL-07-14-16-Making-soapberry-icecream-Red-soapberries-make-red-icecream.mp3 4. Gūshoshīdzídzéʼ detʼele mełēngesī dé detʼele edē lā. https://kaska2016.sites.olt.ubc.ca/files/2017/02/01026-kkz-LJ_WL-07-14-16-Making-soapberry-ice-cream-You-can-pick-berries-until-the-first-frost.mp3 5. Gūshoshdzídzéʼ nenbe didī nī́’ kā gūdezōhī gūdē tsʼį̄́déh. Soapberries- you pick- this- ground- on- frost- becomes- to them. https://kaska2016.sites.olt.ubc.ca/files/2017/02/01027-kkz-LJ-WL-07-14-16-Making-soaberry-ice-cream-Find-a-good-place-where-there-are-lots-of-berries.mp3 6. Jahyigé dzídze nístlōnī tsʼį̄́ʼ kī́nyā dé kū́hyigé dzídze nenbé. Where- berries- lots- to- you find- there- there- berries- you pick. https://kaska2016.sites.olt.ubc.ca/files/2017/02/01028-kkz-LJ-WL-07-14-16-Making-soapberry-icecream-There-are-lots-of-good-places-to-pick-by-the-airport-road.mp3 7. Airportetene kū́hyigé dzídze nístlōnī neyeh lā. Airport road- there- berries- lots- grow- assert. https://kaska2016.sites.olt.ubc.ca/files/2017/02/01029-kkz-LJ-WL-07-14-16-Making-soapberry-icecream-There-are-lots-of-good-places-to-pick-by-the-river.mp3 8. Tūʼ kī́līnī gāgáh kʼī dzídze nístlōnī lā. Water flowing- beside- also- berries- lots- grows- assert. https://kaska2016.sites.olt.ubc.ca/files/2017/02/01030-kkz-LJ-WL-07-14-16-Making-soapberry-icecream-Make-sure-you-pick-a-place-that-is-clean.mp3 9. Dáhyigé nī́ʼ etīe kā dzídze nenbéʼ. Where- ground- good- on- berries- you pick. https://kaska2016.sites.olt.ubc.ca/files/2017/02/01031-kkz-LJ-WL-07-14-16-Making-soapberry-icecream-Dont-forget-to-bring-a-container.mp3 10. Dzídze dege ūsā́ʼ gínʼąh. Berries- for- pot- you carry around. Don’t forget to bring a container. https://kaska2016.sites.olt.ubc.ca/files/2017/02/01033-kkz-LJ-WL-07-14-16-Making-soapberry-icecream-Soapberries-are-really-sticky.mp3 12. Gūshoshīdzídzéʼ łánéyéh detsʼę́tl. https://kaska2016.sites.olt.ubc.ca/files/2017/02/01034-kkz-LJ-WL-07-14-16-Making-soapberry-icecream-You-dont-need-a-lot-of-soapberries-to-make-icecream.mp3 13. Gūshoshdzídzéʼ nístsį̄dlī ghólī dene yehtsį̄h lā. Soapberries- small amount- even- people- make it- assert. https://kaska2016.sites.olt.ubc.ca/files/2017/02/01035-kkz-LJ-WL-07-14-16-Making-soapberry-icecream-Wash-the-soapberries.mp3 14. Kíhseh gūshoshīdzídzéʼ enʼóts. https://kaska2016.sites.olt.ubc.ca/files/2017/02/01036-kkz-LJ-WL-07-14-16-Making-soapberry-icecream-Make-sure-there-are-no-leaves-or-branches-in-the-soapberries.mp3 15. Metah tsʼį̄h etʼāne yéh dechin yéh kénléh. Among it- from- leaves- and- sticks- and- you take them out. https://kaska2016.sites.olt.ubc.ca/files/2017/02/01037-kkz-LJ-WL-07-14-16-Making-soapberry-icecream-Put-the-soapberries-in-a-bowl.mp3 16. Bowl keh gūkéntlʼī́t. Bowl- in- you pour them. https://kaska2016.sites.olt.ubc.ca/files/2017/02/01038-kkz-LJ-WL-07-14-16-Making-soapberry-icecream-Use-fork-or-the-bottom-of-a-cup-to-crush-the-berries.mp3 17. Fork yéh, kū́kʼā yige yéh dzídze metenéndī. Fork- with, cup- under- with- berries- you crush. https://kaska2016.sites.olt.ubc.ca/files/2017/02/01039-kkz-LJ-WL-07-14-16-Making-soapberry-icecream-Add-sugar-to-the-berries.mp3 18. Łedī́hī dzídze tah enlē! Sugar- berries- among- you put. Add sugar to the berries! https://kaska2016.sites.olt.ubc.ca/files/2017/02/01040-kkz-LJ-WL-07-14-16-Making-soapberry-icecream-if-you-like-it-really-sweet-use-more-sugar.mp3 19. Síkʼādé łedī́hī yénlīn déʼ tenéntlʼī́t. Still more- sugar- you want- them- you pour it in. https://kaska2016.sites.olt.ubc.ca/files/2017/02/01041-kkz-LJ-WL-07-14-16-Making-soapberry-icecream-If-you-dont-like-it-really-sweet-use-less-sugar.mp3 20. Dūłā́ łedī́hī yénlīn dé dḗtsédle zelé tenéntlʼī́t. Not- sweet- you want- them- you pour it in. https://kaska2016.sites.olt.ubc.ca/files/2017/02/01042-kkz-LJ-WL-07-14-16-Making-soapberry-icecream-Use-a-stick-to-stir-the-berries.mp3 21. Dechin yéh mełēngis. Use a stick to stir the berries. https://kaska2016.sites.olt.ubc.ca/files/2017/02/01044-kkz-LJ-WL-07-14-16-Making-soapberry-icecream-The-soapberries-will-begin-to-foam.mp3 23. Hadī yéh deghosh edē lā. Quickly- with- foam- becomes- assert. https://kaska2016.sites.olt.ubc.ca/files/2017/02/01045-kkz-LJ-WL-07-14-16-Making-soapberry-icecream-Keep-stirring-until-the-foam-is-firm.mp3 24. Síkʼādé mełēngis meghóshéʼ endū́é edē tsʼį̄́dé. Still more- you stir it- its foam- nothing- becomes- until. https://kaska2016.sites.olt.ubc.ca/files/2017/02/01046-kkz-LJ-WL-07-14-16-Making-soapberry-icecream-Pour-ice-cream-into-smaller-bowls.mp3 25. Bowl zǭ́ze kekéntlʼī́t. Bowl- small- you pour into. Pour ice cream into smaller bowls. https://kaska2016.sites.olt.ubc.ca/files/2017/02/01047-kkz-LJ-WL-07-14-16-Making-soapberry-icecream-Serve-and-enjoy.mp3 26. Īyéh entsets kolā. Hmmm! Soapberry ice cream tastes really good!